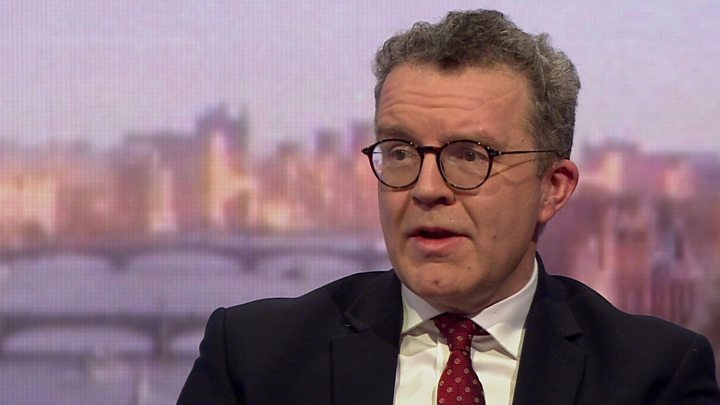 Media captionTom Watson: "I know that he (Jeremy Corbyn) will... share my horror"
Jeremy Corbyn must take a "personal lead" over claims of anti-Semitism in the Labour Party, his deputy has said. Tom Watson told the BBC's Andrew Marr that there was a "crisis for the soul" of the party, fearing more MPs might follow the nine who resigned this week. But he said with the situation being so "grave", Mr Corbyn understood he needed to make a "personal intervention". The deputy leader's comments follow the resignations of nine Labour MPs - eight of which have joined The Independent Group. Appearing on the Andrew Marr Show before Mr Watson, Ms Berger criticised the party's culture, saying: "My values haven't changed. I am the same person. It is my party that has changed." Mr Watson said Ms Berger had been "bullied out of the party by a small number of racist thugs", and attempts to stamp out anti-Semitism so far had "not been adequate" and "have not succeeded". He said Mr Corbyn needed to "rebuild that trust" with the Jewish community across the country and it will be his "test as leader" to eradicate anti-Semitism from the party. "Of course Jeremy [Corbyn] needs to understand that if we're going to be in No 10, he needs to change the Labour Party and there are things we need to do," he said. "We've got to eradicate anti-Semitism, anti-Jewish racism in all its forms [and] for us to address that now, I think he needs to take a personal lead on examining those cases and if necessary, recommend it to our NEC (National Executive Committee) what needs to be done." Mr Watson also criticised the language of shadow foreign secretary Emily Thornberry, who said those who resigned from her party had "betrayed" their seats and would be "crushed" if by-elections were held. She told a Labour rally in Broxtowe, Nottinghamshire, that she would rather die than join a new party. Mr Watson said he thought "dying is a virtue that is over-rated" and said it was "incumbent on all of us to dial down the rhetoric". After his appearance, a Labour Party spokesman said: "The Labour Party takes all complaints of anti-Semitism extremely seriously and we are committed to challenging and campaigning against it in all its forms. "All complaints about anti-Semitism are investigated in line with our rules and procedures and any appropriate disciplinary action is taken."